Bible Mitr (friends of Bible), organised whole day prayer in New Assumption Church, Asha Niketan here today. BibleMitr is the work of God undertaken by some priests, religious and lay people of the Bhopal Archdiocese. Dr. Leo Cornelio SVD was the the main celebrant for the Holy Eucharist. Dr Leo Cornelio, Archbishop of Bhopal said We have organised a day of Adoration through Singing for the needs of the Universal Church, for the cause of the Evangelisation of people and for the various intentions of the people of God in Archdiocese of Bhopal. Using the internet revolution we seek to spread the Word of God to the uttermost parts of the web world. It is an initiative to reach out to the people who are hungry for receiving spiritual "manna" daily, day in and day out. May the Word of God touch the lives of those who "Seek God in spirit and in truth. Fr. Suman Tirkey, President, Bible Mitr said BibleMitr is the realisation of a dream nurtured by some priests and laity who really desire to see the Spreading of the Word of God through the fast spreading Internet and IT Media which is currently revolutionizing the whole world. The Bible is full of love and we need to spread it to everyone irrespective of caste, creed and religion. Christs preaching of love is for everyone and there is no boundary attached to it, he said. The Adoration was conducted people from various parishes and mission stations of the Archdiocese of Bhopal accompanied by priests and sisters. Some simple truths, if adopted in everyday life around, completely.We'll happier, more peaceful if we follow these simple tips. 1. Say Yes to Life. "Be not afraid of life. Believe that life is worth living, and your belief will help create the fact." Saying yes to life allows wonderful blessings to come to you. Say yes to opportunity and success. Say yes to a life that you live by your standards. Say yes to making your own decisions and not seeking approval of others. Say yes to a fulfilling and rewarding career. Say yes to a relationship that energizes, supports and stimulates you. Say yes to a promising future. Say yes to living without guilt, resentment or regrets. Say yes to spending more time on your self improvement. Say yes to living an authentic life. Say yes to taking chances and freeing yourself from fear. Say yes to happiness and achievements. Say yes to a well-lived life. 2. Love Yourself and Others Unconditionally.When was the last time you loved without hesitation or caution? Withholding love as a means of control only leads to distrust and resentment. Loving unconditionally means loving without judgment. Free yourself from unrealistic expectations and accept the person you love for who they are. Do not expect your needs and wants to be fulfilled by someone else. Allow those you love to express themselves without fear of rejection. Do not punish yourself or loved ones for past mistakes. People use the word love very loosely, but do not stop to think of the implications of using the word. Take the time to be responsible in how you show love. Allow yourself to love and be loved. 3. Take Risks "There came a time when the risk to remain tight in the bud was more painful than the risk it took to blossom." - Anais Nin. Everything in life involves a risk. Are you allowing fear of rejection and failure to dictate your life? Fear inhibits success. Take chances and free yourself from limiting beliefs. Taking risks empowers you to take charge of your life. Be curious about life; experiment and try new things. Set goals for yourself and take action. Step out of what is safe, comfortable and familiar to you. Examine what feelings emerge when you are thinking about taking a risk. Ask yourself, "What am I afraid of?" Concealing yourself in a safe container prevents you from exploring other possibilities. Embrace the unknown and anticipate success. You will never know the outcome if you don't take the risk. 4. Make the Impossible, Possible Winston Churchill said, "The pessimist sees difficulty in every opportunity. The optimist sees the opportunity in every difficulty." Think it can't happen; then it won't. It is possible to get through the difficult times in life. Learn from failures and take responsibility for your life. Listening to your inner critic can sabotage your dreams. Silence the critic by reaffirming all the things you are capable of doing. Dream big and be excited about your future. Find and release your untapped talents. Believe in your abilities and discover what you have to offer the world. Think about all the things you can't do and try to do them. Think back to a time, when something was difficult and you were able to overcome the challenge. Continuing to live life in a safe container doesn't help you gain anything in life. Take the necessary actions to achieve your goals. Stop assuming and start achieving! 5. Make Your Life Really Count. Annie Dillard, "How we spend our days is, of course, how we spend our lives." What's your legacy? How do you want to be remembered? The life you live defines who you are and the choices you make will determine what impact you will have on the lives of others. Never underestimate the power of your words and actions. You were uniquely created to make a contribution to the world. It is your right and your obligation to make your mark in this world. Surround yourself with people who are supportive, positive and encouraging. Show appreciation and gratitude to those around you. If you have a message to share, then share it with the world. Staying small and thinking small will not get you where you need to be in life. Starting today, have a new perspective on life. Start a new chapter in your life. The mind is always restless on account of greed. Greed is a kind of internal fire that consumes you slowly. The most effective antidote to greed is contentment. Just as a man who, sun-scorched, is refreshed by taking a plunge in the river, so also the greedy man burnt by the ire of lobha finds immediate joy and relief by a dip in the ambrosial water of contentment. There are four sentinels who guard the domain of moksha. They are shanti, santosha, satsanga and vichara-peace, happiness, good company and self-inquiry. If you can approach any one of these. you can get hold of the other three. There is no greater gain than contentment. "A contented mind is a continual feast. "A man who is fully endowed with this important virtue is the richest man. The peace that he enjoys cannot be adequately described in words. Tayumana Swami, the requted sage of southern India, says: "Even the richest man in this world who is equal to Kubera who possess Chintamani, Kamadhenu and Kalptaru, desires to have a domain overseas. He tries to practise alchemy to have more wealth. That man who is living up to 150 years tries to prolong his longevity by talking Rasayanas and Siddha Kalpas. He who possesses one hundred crores of rupees tries his level best to make it two hundred crores of rupees. The mind grasps one thing and leaves it the next moment and says: 'This is mine. That is mine. I will try to possess that also'." If contentment is such a great virtue and we know it, why do we not cultivate it? Greed is the chief officer of passion. Wherever there is greed, there is passion, and wherever there is passion there is greed almost invariably. The intellect gets perverted and memory gets confused by passion and greed. A seeker asks, "It i become contented, all my ambitions will die. I will become lethargic and lazy. On account of my various sorts of ambitions, i exert and i am energetic." My reply: Contentment can never make you idle. It is a sattvic virtue that porpels the individual towards God. It gives strength of mind and peace. It chcks unnecessary and selfish exertions. It opens the inner eye and moves the mind towards divine contemplation. It turns his energy to inner, sattvic channels. It transmutes the gross energy, greed, into spiritual energy, ojas. The contented person is full of sattva. His mind is now collected and peaceful. Contentment is bliss. Repeat mentally, "Aum contentment". And you'll soon feel contentment enveloping you. It is the best medicine. Happiness consists not in possessing much but in being content with what you possess. He who wants little always has enough. Wealth or power hrings its peculiar inconveniences and troubles. Artha, wealth is anartha, evil. A rich man and a man of power have their own secret griefs. The mind cooled by calm contentment is ever peaceful. Divine light can descend on an aspirant who is endowed with contentment. A contended man is one who does not long for what he does not possess; he enjoys what he has in the right manner. He is quite satisfied with whatsoever he gets. He is magnanimous and graceful. The calm countenance of a contented person gives delight to those who come in contact with him. 'How to cultivate virtues and eradicate vices'. Sri Lankan President Shri Mahinda Rajapaksa has said that "we need to look back to our civilizations. The wisdom that prevailed in ancient times has to be rediscovered. He said that it is the responsibility of all to disseminate message of peace, harmony and compassion in the entire world now. Shri Rajapaksa was addressing a huge public meeting afte laying foundation stone of Sanchi Buddhist and Indic Studies University at Sanchi on September 21, 2012. 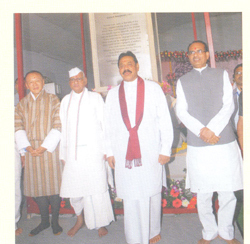 Bhutanese Prime Minister Shri Jigme Y. Thinley, Governor Shri Chouhan, Dr.B.R. Ambedkar's grandson Shri Prakash Ambedkar and 12 countries' monks and scholars graced the occasion. Shri Rajapaksa said that he has brought message of peace and love from Sri Lanka offering a sapling of Vat Vriksh - Banyan Tree, which was planted in Sri Lanka by Mahendra and Sanghmitra. The university will follow traditions of unique path of higher education adopted by Indian universities like Taxila, Nalanda, Vallabhi and Vikramashila. The university will disseminate knowledge through research and studies with the help of rich and diverse dimensions. The educations system we have inherited from colonial past often hinders development of human intellect and connection between life and spiritual world is overlooked. It not only attaches importance to personal achievements and ambitions, but also promotes a new ruthless competition and meaningless consumption. The University will disseminate education by which one can lead life in its totality. This university will make relevant the Buddhist and Indic knowledge based on studies, self-introspection and traditional knowledge. India and Sri Lanka are one land from the point of view of friendship and history. Federal structure and emergence of states has not changed our outlook towards India. Sri Lankan people and government will continue their contribution for success of this university. Bhutanese Prime Minister Shri Jigme Y. Thinley described the occasion of Sanchi University' foundation laying ceremony as a moment of happiness and pride for him. He said that people and government of Bhutan wish for this university's success. Every possible cooperation will be extended to th euniversity. He said that India and Bhutan have age-old cultural ties. Several countries are impressed by friendship of these countries. He hoped that establishment of Sanchi University will pave the way for comprehensive study of various languages, religions and cultures. He said that science and technology is not everything in life, spiritual development of human beings is also necessary. He said that this university will certainly promote lofty ideologies. Government and Chancellor of Sanchi University Shri Ram Naresh Yadav said that this university will be unique. It will assist in disseminating message of peace and love along with knowledge. Dwelling in detail on Sanchi's religious, historic and archaeological importance, he said that Madhya Pradesh government is making all-out efforts for its preservation. It is a symbol of devotion to Lord Buddha. The Governor said that Sanchi Buddhist and Indic Studies Univerdsity will help in devepopment of lofty vision of life. He hoped that this unversity will set parameters of education and religion at the global level. Chief Minister Shri Shivraj Singh Chouhan said that a grand temple should be built in Sri Lanka at the site where Sita Ji had to under go Agni Pariksha. Madhya Pradesh government will extend every possible assistance in this work. He said that Buddha Gaya will also be included in Mukhyamantri Teerth-Darshan Yojna. Concession in fares will also be given to pilgrims visiting Sita-Sthal in Sri Lanka. He said that goodwill visits of Indian and Sri Lankan youths should be organised. Shri Chouhan said that Lord Buddha gave message of Hinduism. Shri Chouhan said that Sanchi Buddhist and Indic Studies University will certainly become an academic pilgrimage for the upcoming generation. It will create a bridge between Buddhist philosophy and Indian Thought. Shri Chouhan said that good government can be possible only with compassion. Religion, culture and folk views are deep rooted in Madhya Pradesh. Sanchi University will develop a new shape of India's multi-hued and multi-belief traditions. Researches between Indian and other Asian countries. Special stress will be laid on contribution of teachers and scholars of Asia and world towards development of this university. Mahobodhi Society of Srilanka president Shri Ven. Bangal Upatissa Thero, Swami Dayanad Saraswati's representative Swami Paramatamanand and Shri Prakash Ambedkar also expressed their views on the occasion. Buddhist scholars and monks from Thailand, Vietnam, Cambodia, China, Japan, Taiwan, Mangolia, Singapore and other countries were present on the occasion. Foundation laying ceremony of Sanchi Buddhist and Indic Studies University was performed in the presence of Sri Lankan President Shri Mahinda Rajapaksa, Bhutanese Prime Minister Shri Jigme Y. Thinley, Governor Shri Ram Naresh Yadav, Chief Minister Shri Shivraj Singh Chouhan, Shri Prakash Ambedkar, Swami Paramtmanand Saraswati and Shri Ven Vangal Upatista Nayak Thero. During the programme, Sri Lankan President Shri Rajapaksa and Bhutanese Prime Minister Shri Thinley planted saplings of buddha tree brought by them at the foundation venue. The guest laid the foundation with special bricks brought from Sri Lanka. These special bricks contain five metals, vegetables, medicines and other auspicious things. Foundation was laid as per Sanatan Dharma and Buddhist rites. Madhya Pradesh government has allotted 100 acre land for the university. About Rs. 300 crore will be spent on its establishment in two phases. Sri Lankan President Shri Mahinda Rajppaksa saw Buddhist Stupas at World Heritage Sanchi today. Shri Rajapaksa was mesmerized by World Heritage Sanchi Stupas and the beauty of its grand arches. He also witnessed Vihar and reservoir excavated near the Stupa by Archaeological Survey of India. The 40-minute visit gave a divine experience to the President. He also planted a mango sapling on the temple's premises. Monks present on the occasion performed special prayers. They took the President round Holy Relics of Lord Buddha's disciples Sariputra and Mahamaudglayan and blessed him. On behalf of the State Government, Culture Minister Shri Laxmikant Sharma handed over documents to Shri Rajapaksa regarding transfer of temple land to Mahabodhi Society of Sri Lanka. The International Dharma-Dhamma Conference at Bhopal, which marked the foundation laying of Sanch Buddhist and Indic Studies University was attended by Buddhist scholars, monks and Indian scholars from across the South Asian nations. Addressin the two-day conference, the Chief Minister Shri Shivraj Singh Chouhan said that Dharma and Dhamma pursue the same goal-welfare of humanity. He said that good governance is the reflection of Darma and Dhamma. As many as 235 representatives from 19 countries participated in the two-day international conference. Central Tibetan University vice-chancellor Shri Geshe Sampatan presided over the inaugural session. Higher Education, Culture and Public Relations Minister Shri Laxmikant Sharma, Baba Saheb's grandson Dr. Prakash Ambedkar, Prof. Anand Gurge and Mahabodhi Society Sri Lanka chairman Shri Bangala Upastissa Nayak Thero were also on the dais. Scholars from various countries presented their research papers, philosophical thoughts and insights in the present contexts. Dignitaries lavishly praised the Chief Minister Shri Chouhan for his initiative to establish Sanchi Buddhist and Indic Studies University. Gautam Buddha taught us examine things on merit. There are similarities between Buddhism and Brahmanism. The Middle Path is the key to human welfare and development. The problems - socio-economic or political emanate from uncontrolled desire to acquire resources. Spreading teachings of Dharma and Dhamma will help address these problems. Striking balance between ancient and modern thoughts is need of the hour. There should be harmony in these views. The major determinants of personality of an individual may be biological, cultural, social or situational factors. The biological factors include heredity, brain and physical features; that of culture include beliefs, values and the likes; social ones include family, socialization and the identification process of self as an entity by an individual in turn trying to replicate himself as his father or mother; and situational factors is a mixed m�lange of environment, knowledge, skill and language.